In close collaboration with EATON, Bezares has developed a new range of PTOs for Eaton Endurant transmission, incorporating to the existing range the 8510 Series for the bottom opening and different PTOs for the rear opening. The 8500/8510 Series is the strongest PTO developed by Bezares for the American market and it allows to work in very demanding applications of high torque and power. The new rear PTOs combine a strong and flexible design with a rotated output which improves the position of the pump avoiding possible interferences with other elements of the vehicle. The PTOs are available with three different internal ratios and will allow you to get the best out of the gearbox, which can transmit a maximum torque of 382 Lb.ft (510 Nm). The PTOs are available with three different internal ratios and will allow you to get the best out of the gearbox, which can transmit a maximum torque of 382 Lb.ft (510 Nm). Endurant transmissions are equipped with an 8-Bolt bottom-opening and with a 4-Bolt rear-opening. Bezares, represented by its Master Distributor for Australia, GFR INDUSTRIES will be exhibiting at the Brisbane Truck Show, from the 16th to the 19th of May at the Brisbane Convention & Exhibition Centre. Dating back to 1968, the Brisbane Truck Show is far more than a trade exhibition. It is a showcase of the amazing capabilities and capacity of the Australian heavy vehicle industry. Through complementary activities within the show we will celebrate and promote the industry’s design, engineering, manufacturing and technology innovation, and the vital economic and highly-skilled employment footprint of our industry across Australia. The 2019 Brisbane Truck Show is taking a series of further leaps ahead, as we cement its place as Australasia’s premier transport event. We’re adding a variety of new elements to the show which will focus more of the event on its business audience featuring dynamic and interactive tools and displays, demonstrations and information. See you at booth MEZZ – 156! Bezares USA attended the North America’s largest commercial vehicle event, “The Work Truck Show”. We announced our recent agreement with Eaton to become the North American master distributor for our mobile power hydraulic portfolio. Among other products, Eaton showed the new PTO range for their Endurant transmissions, Bezares 2010 and 4110 series. Available for gearbox models EEO-14F112C, EEO-15F112C, EEO-16F112C, EEO-17F112C, EEO-18F112C. The Work Truck Show featured the newest trucks, vans, vehicle components and truck equipment on an exhibit floor covering more than 500,000 square feet. The event includes a robust educational conference with sessions designed to help attendees improve their operations. This software permits to easily cross Chelsea and Muncie PTO part numbers into Bezares ones. Simply enter the Chelsea or Muncie reference in the respective field, and the application will display the crossover. Bezares will be exhibiting at the world’s leading trade fair, Bauma 2019. The 32nd edition of Bauma, to be held in Munich from April 8 to 14, 2019, can already announce a new record number of exhibitors: More than 3,500 exhibitors from 55 countries will be there—almost 100 more than in 2016. What is more, the 600,000 visitors mark is ready to be passed. In this edition, Bezares will present its latest developments in hydraulic pumps and motors as well as new PTOs. Looking forward to meet you at the Hall A4 – Stand 220. Stay tuned for big news in the FR / MR piston pumps family in 2019! Bezares has a complete series of pumps and motors, divided into 3 sub-families, the reinforced heavy-duty FR series, the compact medium-duty MR series and the FRM bidirectional Motors series. In addition, the next few months reserve us some big news in the Bezares piston pumps line: The most advanced pump ever developed by Bezares that will compete in price and quality with the leading models in the market and promise to revolutionize our Piston Pumps offers. For more information about the FR and MR family of pumps and motors, visit the MR Webpage, the FR webpage, the FRM piston motor Webpage or contact the commercial department. BZC winches are now more robust and reliable, due to a completely new cable tensioner system developed to extend the life of its components. This new cable tensioners design preserves the rollers in the pressure zone to protect the cable, the rollers have been deliberately oversized to avoid cable trapping when the cable enters the drum badly wound or with a knot. The pressure rollers have been manufactured in polyethylene to protect the cable at all times, while avoiding rubbing metal with metal with other components such as the drum. In addition, it has been added a simple system to regulate the pressure exerted on the cable, guaranteeing the perfect functioning of the system and adding an important advantage over the other offers on the market. The new cable tensioner and pressure control system are compatible with previous models of the BZC winches and can be ordered individually with the code 9038825 so that all the users of the BZC winches can enjoy the 2019 model’s advantages. information, check out the BZC Winch Webpage or contact the commercial department. Bezares has started to gradually ship all its products with part numbers, serial numbers and warranty information encoded into a BIDI standard sticker. The new encoding provides a better and quicker production tracking, allowing a finer quality control and trackability, faster internal processes and, thanks to its open standards, a way for final users to easily access this information using existing technology such as a reader APP installed in a regular smartphone. This change will allow us to improve our internal processes as well as to have a better identification of potential root problems in warranty claims, resulting in better after sales services. Bezares SA has reached a distribution agreement with EATON to have it as the North American Master Distributor for the aftermarket hydraulic portfolio. Eaton is a power management company that provides energy-efficient solutions to effectively manage electrical, hydraulic and mechanical power more efficiently, safely and sustainably. In addition to distribution services, Eaton will also provide post-sale and support services. Bezares’ decades of expertise and extensive mobile hydraulic portfolio will allow Eaton to offer comprehensive mobile hydraulic solutions that meet customer needs for PTOs and other hydraulic products. Since PTOs are powered by the transmission, customers will be able to draw on Eaton’s knowledge in the area to develop complete customized systems to suit any hydraulic needs and applications. Eaton and Bezares will work together to ensure a smooth transition of customers to allow for continued sales and service of the Bezares portfolio. 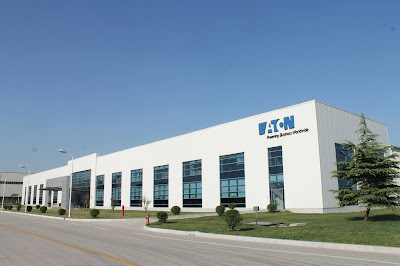 To ensure product availability for North American customers, Eaton is stocking inventory at the Eaton Logistics Center. More information about these new products can be found at Eaton’s aftermarket portal, www.EatonPartsOnline.com. Bezares SA is a global manufacturer of Power Takeoffs (PTOs), hydraulic pumps, fittings, tanks, valves and other related mobile power hydraulic components. Bezares is proud to announce its new WordPress-based webpage. With a responsive design easily adaptable to any screen size, 100% GDPR compliant and with a database-driven product catalog, the new webpage represents a new step on its intuitive user interface and its integration. WordPress powers 32% of all the websites on the Internet, and if you limit the data set to only websites with a known CMS, WordPress holds a 59.5% market share, guaranteeing long-term support and scalability. The new webpage is also ready for e-commerce, offering a big opportunity for future online services. Bezares has now a new test bench that allows more demanding laboratory and production tests, which can reach maximum pressures of 420 bar and maximum flow rates of 450 liters per minute. This bench is provided with a new custom-designed software, which controls the conditions of the tests through the central console or remotely from a computer or mobile device. It also allows automatic tracking of the results obtained in each batch, the rejected units that did not pass the test and it stores in the system the failure’s root cause, when this has been corrected. This new test bench, made by Aliauto, is equipped with a 200 kW engine at 3000 rpm and has two different work stations, one for hydraulic motors and the other for hydraulic pumps. Bezares has been exhibiting at the EUREXPO LYON, in Chassieu Grand Lyon. Pollutec celebrated its 40th anniversary in 2018. The fair has established itself as a true showcase for all equipment, technologies and environment and energy services. It represents a springboard for market innovations and a crossroads for international development opportunities to connect all those with a stake in the industry, where 2,200 Exhibitors and 73,000 Professionals from 128 countries participated. We would like to thank all our visitors and collaborators and hope to meet you again in the next edition! Bezares incorporates a new vertical milling machine from Chevalier. Bezares has incorporated the new Chevalier’s third-generation high precision flat grinding machine, FSG-1632ADIII into its production line. It has CNC control of all its axes, 8″ touchscreen, reinforced needles roller guides at its three axes, diamond grinding process, automatic wear adjustment and many other last generation novelties. Bezares, through its subsidiary in China Bezares Power Transmission, participated in the Bauma China last November in Shanghai, China. The world’s second largest trade fair for construction machines after Bauma Munich had an exhibition space of 300,000 square meters. “The entire area of the Shanghai New International Expo Centre—17 halls and the outdoor area— was completely occupied” Maritta Lepp, bauma CHINA’s Exhibition Director reports. The trade show’s high reputation attracts renowned companies from both China and from all over the world. Various countries—including Germany, Italy, Korea, Spain, Turkey and the U.S.— presented themselves with joint stands. The advantages of this central organization: joint booths help especially small and medium-sized companies find cooperation partners and enter this large market. Thanks for all our clients and partners that visited or booth.